Getting started with electronics is not easy. The first thing you need is passion and commitment. If electronics is your hobby and passion then you are already in a winning position. The main element of training in electronics is practice. It is best to start with small designs and issues that will develop your intuition in design. But to know how it all works, you have to have strong theoretical foundations. You need to know about each electronic element and circuit dependencies. It is worth knowing the characteristics of the electronic components and their applications. You need to have the ability to calculate circuits during design to avoid problems during assembly and testing projects. 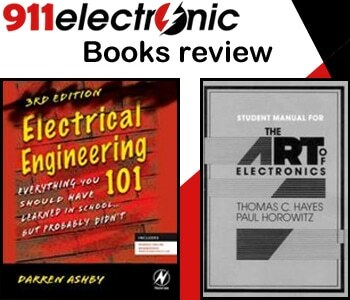 To learn the basics of electronics, knowledge is sought in books. These are books recommended by many people practically dealing with the electronic field. After studying such literary positions we can more and more confidently create ever better and more elaborate projects. The book explains the principles of creating electronic circuits analogue and digital. This is the latest version supplemented by current trends in project creation by the best engineers in the electronics industry. The student version is a shortened version that provides condensed knowledge that is ideally suited for students and beginners. The book has many positive comments. On The Art of Electronics has 45 reviews and 4/5 ratings. The book explains the basics of electrics. It explains the principle of operation of individual electronic components and applies comparisons to everyday life that are easy to understand. This item has a chapter on the rules of managing your own projects. In the book we will also find ready-made projects and ways of doing them. The third edition contains more comparisons to the real world, which make it easier to understand the components. The book contains descriptions of microcontrollers, FPGAs, electronic chip building, transistor-based devices and amplifiers. The book has many positive comments. At www.betterworldbooks.com has 111 reviews and an average rating of 4/5.